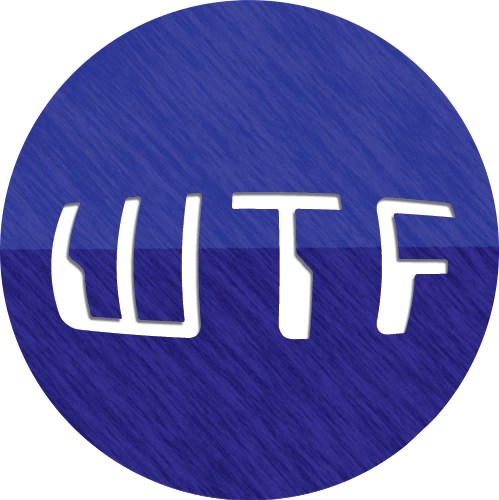 When I decided to create this blog to host my reviews, I also know that I would need to create many screenshots of whatever app I’m testing, so everyone who read my reviews could see all the features I’m talking about without having to install the app themselves. And for me, words are not enough to convince me to do something; I need to see the proofs. I’m not having any problem with taking screenshots on my laptop (both OSes) or my phone, but I never got to find out how do I take a screenshot on my phablet. I used to have the same problem with my phone. I solved it for a while by installing a screenshot-taking app, but I quit using that when I found out on a tech forum that I could take a screenshot by pressing Back and Home button together. Sadly, my phablet is a cheap one, with a weird-sounding brand I’ve never heard anyone mentioning, so it’s very hard to find support for it on the internet. Not even drivers. And before you asked me, I’ve tried every button combination available. 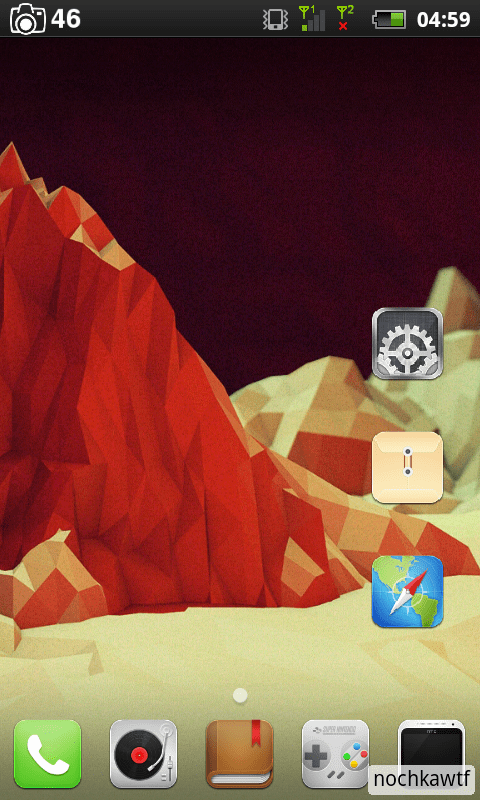 I finally ended finding a screenshot-taking app. I’m not having high hopes for this, since most of such apps needed my phablet to be rooted (which it doesn’t), or only usable for some devices/brands, or have reviews like ‘this app is a time-wasting crap! don’t download this!!’. 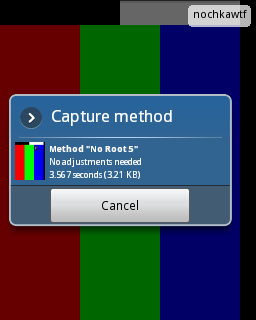 But I found this app, Screenshot Ultimate, which doesn’t mention anything about rooting or only works for some devices. 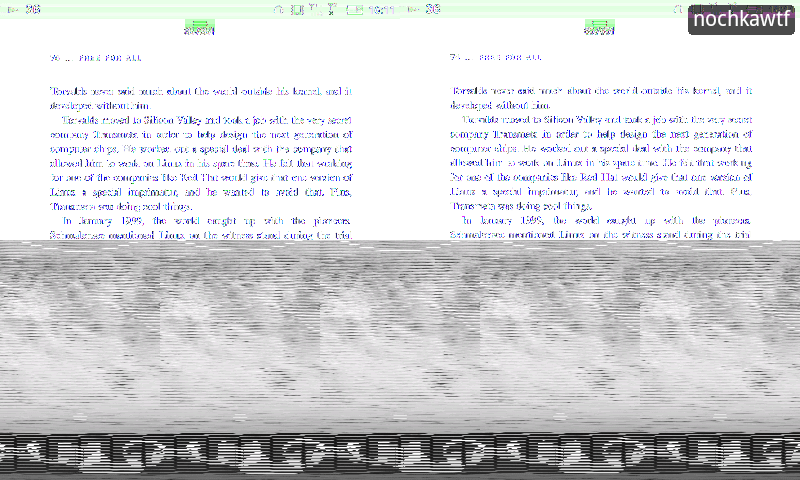 I also noticed that it came with an image editor, but I don’t think much about it. 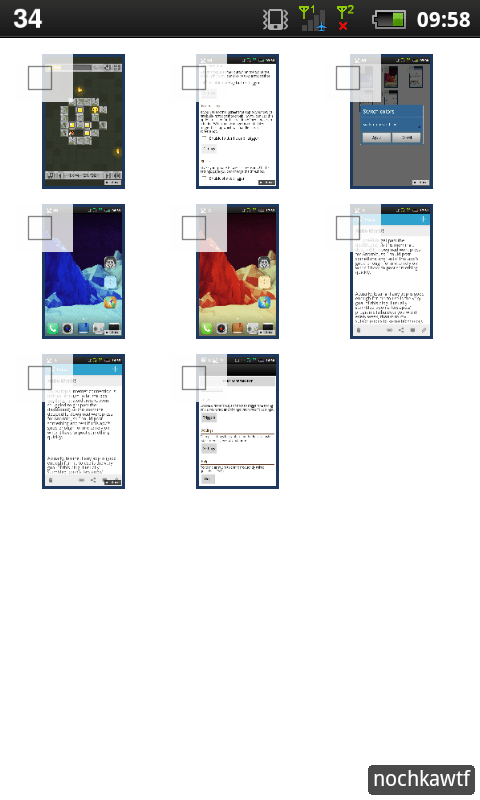 All I want to do is to take screenshots of my phablet. Notice anything wrong? 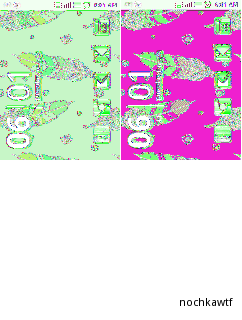 Yeah, the colors are little funny. 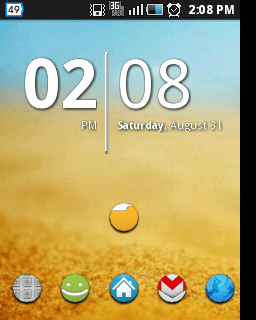 Look at the battery and signal strength icon on the notification bar. 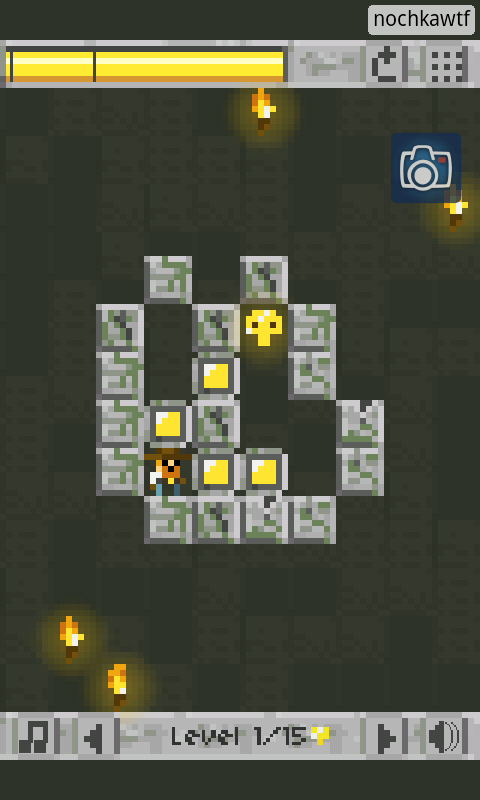 Or the compass icon on the right of the screen. Don’t worry, we’ll fix this soon. For now, let’s focus to the fact that this app works. 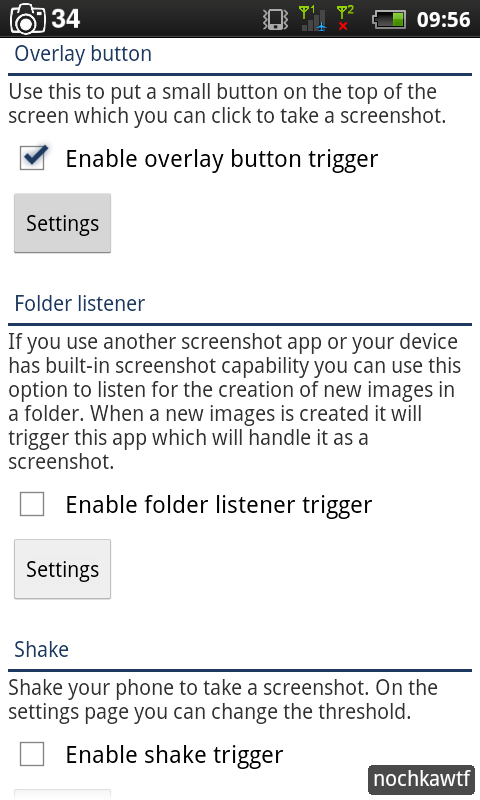 Besides pressing that large button, there are other ways you could take screenshots with this app. You could choose how do you like it from the ‘Trigger’ menu. The options on the Trigger menu allow you to take screenshot by an overlay button, shaking your phone, sliding the notification bar and clicking the app’s icon, talking to your phone’s microphone (not just talking, actually. You could trigger it by pointing the microphone to any sound source, besides your mouth), connecting/disconnecting your phone to a power source, from a widget on your home screen, and some more. I mostly use the notification area button, but sometimes I use the overlay button when I need to take a screenshot for full-screen apps. It’s the fastest way too. 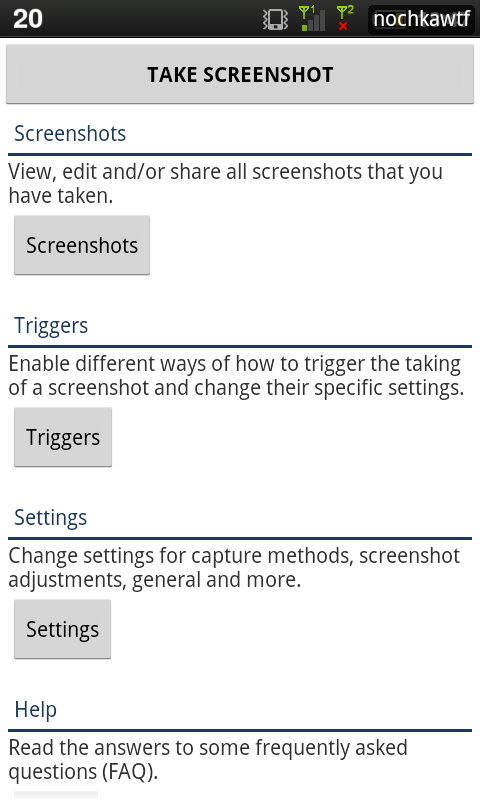 The Settings menu on all the triggers are basically the same, on which you could set what the app should do after taking a screenshot (edit it/share it/view it/ask for what to do/do nothing), and set a timer. There are several extra options for some triggers, such as sensitivity setting for the shake trigger. 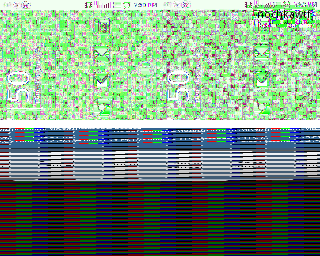 This is the image editor I’ve been telling you about. It has no buttons; only options on a floating dialogue, but you could do many things with it. The image editor doesn’t have many cosmetic features, besides of 9 effects it offered plus a mirror effect (who would use that? And what for?). 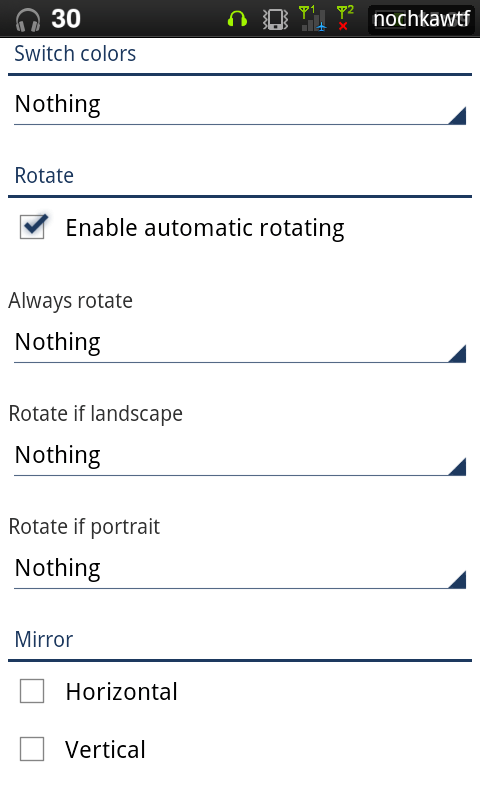 It offers mostly adjustment features such as drawing tool, crop, rotate, and adding text. 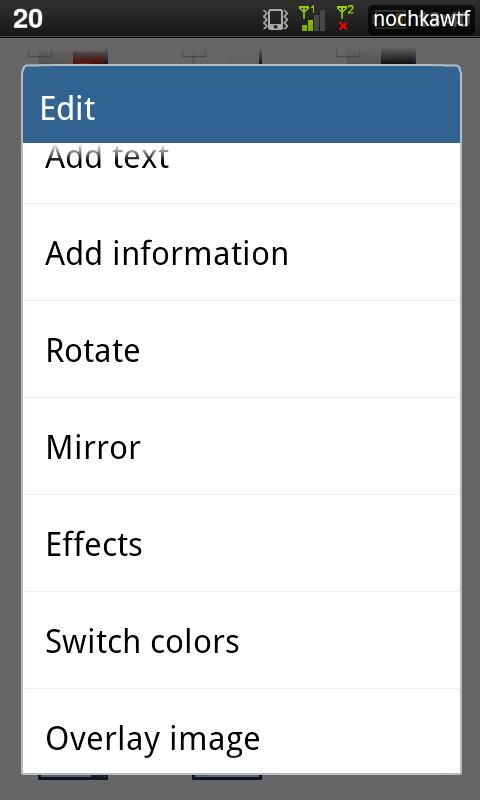 It also saves your original screenshot, so you could revert back to it if something goes wrong with the editing (there’s no Undo button). 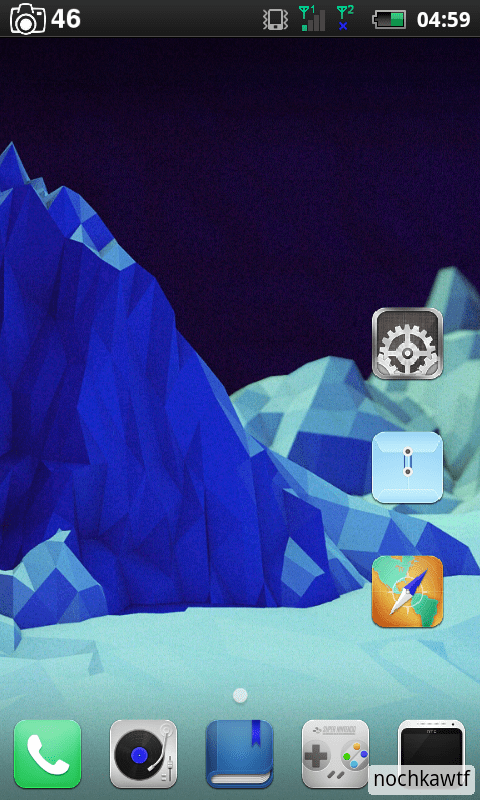 Now the screenshot has the right colors, and looks just like my homescreen. You could do this on every miscoloured screenshots you’ve taken, but wouldn’t that become an annoying, repetitive task? Maybe the app didn’t choose the right capture method. 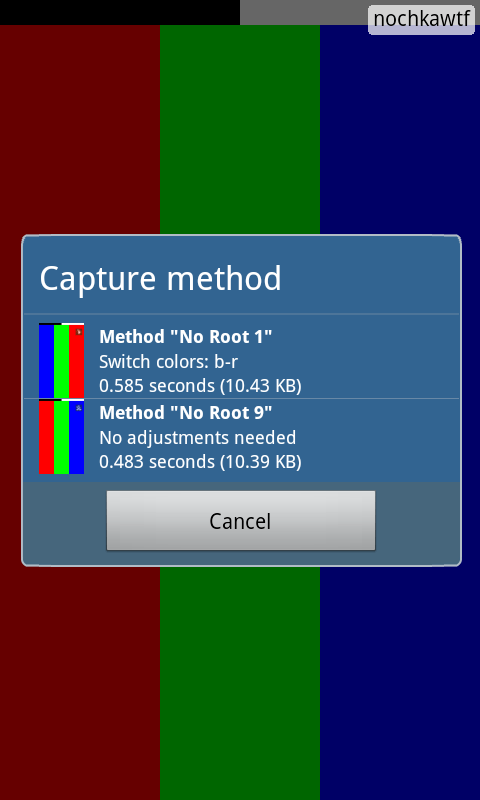 As I’ve said before, when the app started for the first time, it would try every capturing method possible to take a screenshot on an Android phone, and it seems like it would stick on the first method it found to be succesful, although there are more than one working method. Or at least that’s what happened to my phablet. 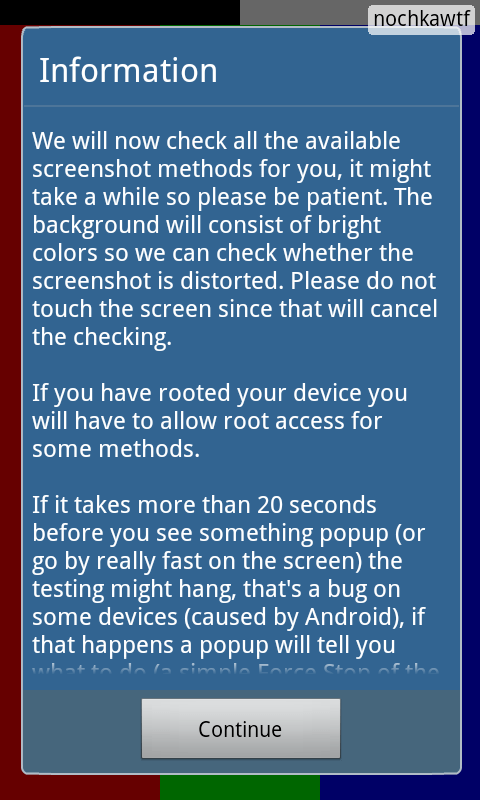 So apparently there are 32 possible method of screen capturing of an Android phone, 16 for rooted phones and the other half for unrooted (‘No Root’) phones. 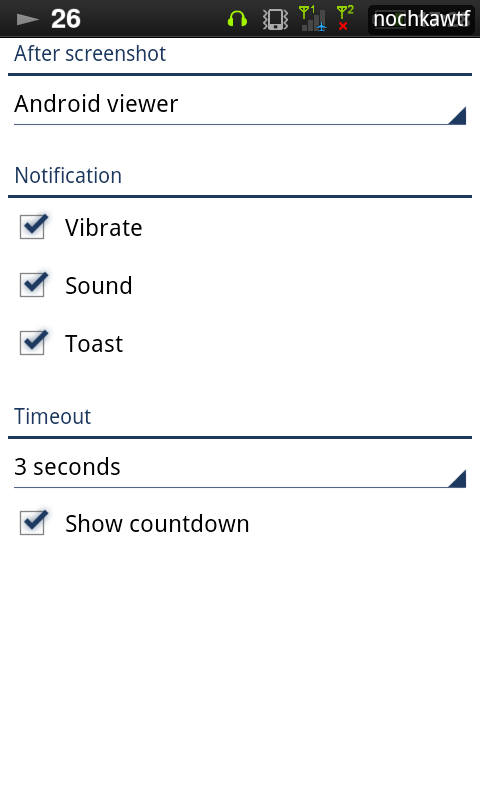 And there are two working methods for my phablet. 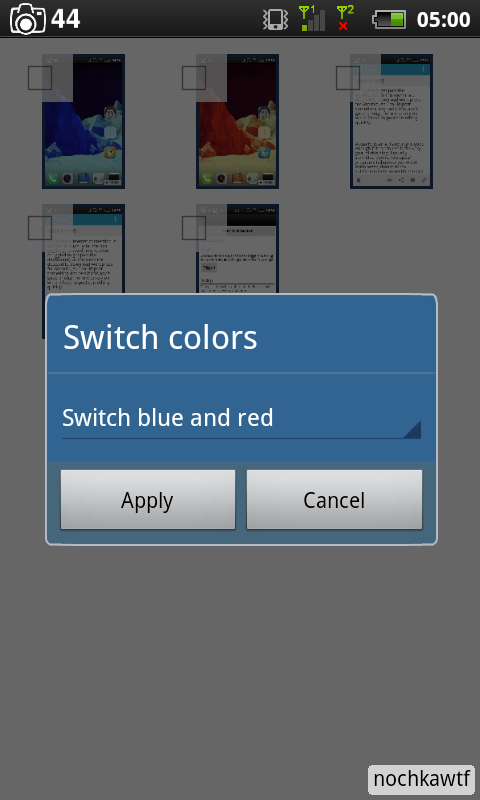 The dialogue shows that the first method has the color swapped (blue and red), while the second doesn’t need any adjustments and will work just right. I’ve also tested this app on my phone, and it works just like how this app works on my phablet, so I guess that there’s no need for another review. 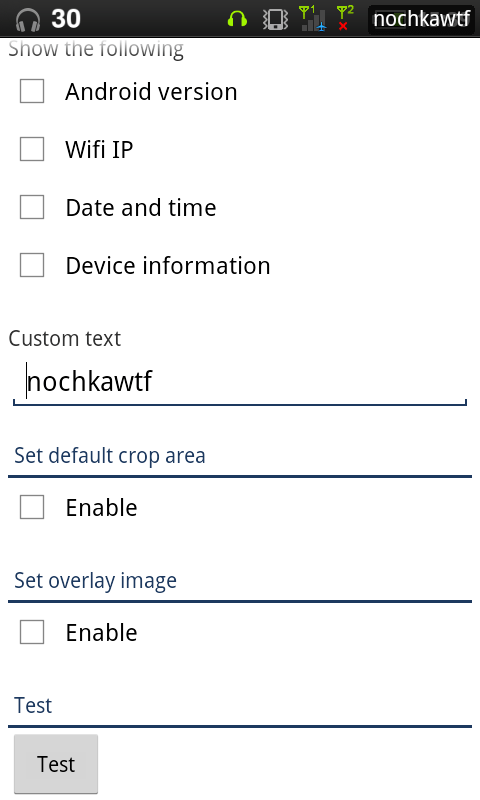 As a note, the Crop feature works just right when I applied it manually (when I selected a screenshot from the in-app gallery and crop it using the image editor). Although I haven’t try it on other phones, I think that this app is the best screenshot app you could get if your device is unrooted. 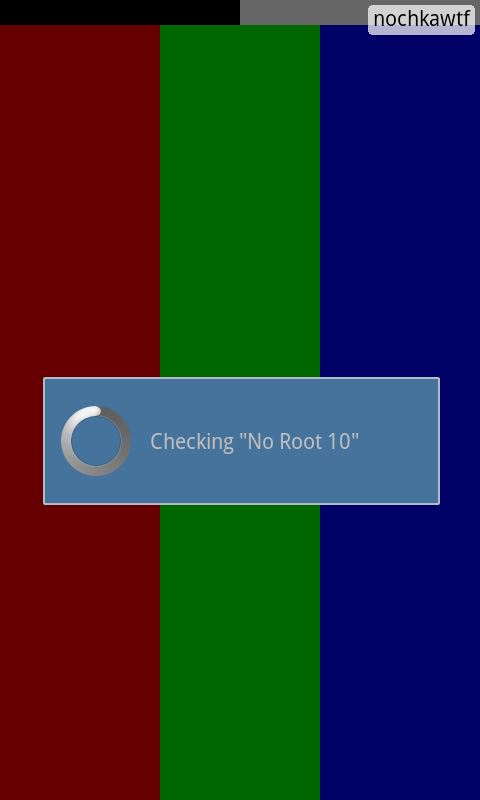 It has 16 possible methods for taking a screenshot for an Android phone, and while I won’t say that this app will work on any unrooted devices, there’s a big chance that your (unrooted) device is supported. If you’re just the type of person who take screenshots rarely and only take screenshots of – let’s say – a funny tweet you happened to read on the Twittter app (I’ve met someone who asked me how to use a screenshot-taking app for rooted phones only to do that), maybe you wouldn’t need this app, and you should search the internet for the buttons combination instead. Although taking screenshots with this app is much easier given that you could use various triggers, the built-in editor might be a bit overkill. But, if you’re the type of person who take screenshots for technical reasons (to make a documentation, or to point out a bug/error, or to make reviews) and you do it frequently, this app would be really helpful, especially for the screenshot gallery and the auto adjustment feature. The only problem I found in this app is its inability to create landscape screenshots and apply automatic cropping properly. Aside of those, everything works perfectly. Note: This app has ads on the top (main menu), bottom (on the options) and the center (after taking a screenshot) of the screen, but they didn’t show on the screenshots because I don’t set my devices to connect to 3G networks. It’s a small price to pay for the free version. Download it from Play Store from here.